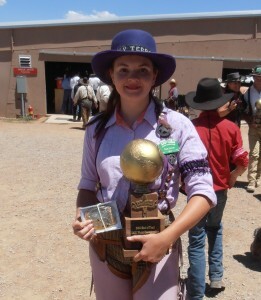 HOUSTON, Texas – Comp-Tac Victory Gear’s Randi Rogers is widely recognized as the top woman shooter in the sport of Cowboy Action Shooting and proved it this past weekend when she won, for the 10th time, the Single Action Shooting Society’s (SASS) Overall Ladies World Championship at End of Trail in Edgewood, N.M.
SASS is the national governing body for Cowboy Action Shooting, which is an all-steel target competition featuring single-action revolvers, lever-action rifles, and pump-action or double barrel shotguns of a pre-1900 design. 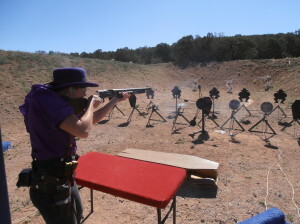 Cowboy Action participants take on old west style aliases and dress in period attire to compete against the clock in this multi-gun sport. Rogers, who shoots Cowboy Action under the alias of Holy Terror, finished 16th overall out of the 550 competitors in the championship. This year marks the 11th time that Rogers has placed in the top 16 at the championship. Rogers is now the current women’s world champion in Cowboy Action Shooting and the International Practical Shooting Confederation (IPSC). In addition, she is the current Ladies National Iron Sight Champion in Steel Challenge Shooting Association (SCSA) and has won the High Lady title at the Smith & Wesson International Defensive Pistol Association (IDPA) Indoor Nationals, the IDPA European Cup and the IDPA Carolina Cup. “One of the great things about Randi is the breadth and diversity of her shooting skills. We brought her on at Comp-Tac to expand our sales and marketing department, as well as our shooting team. And while Comp- Tac is focused on the modern shooting sports, like IDPA, and the concealed carry, personal defense, and law enforcement markets, we could not be more proud of Randi’s accomplishments in Cowboy Action Shooting. Now we just have to get her back into one of our new Kydex holsters,” joked Gregg Garrett, owner and president of Comp-Tac. In addition to competing at End of Trail, Rogers arranged Comp-Tac’s sponsorship of the SASS Wild Bunch competition which took place immediately prior to the SASS world championship, June 17-19. Next up for Rogers and the rest of Team Comp-Tac is the Texas State IDPA Championship which takes place June 29th in Greenville, Texas. The Houston-based Comp-Tac Victory Gear is also sponsoring the match.